I’m at the halfway point of another transformation using Annie Sloan Chalk Paint (although I’m hoping to sell these gorgeous chairs to new owners once they’re finished). 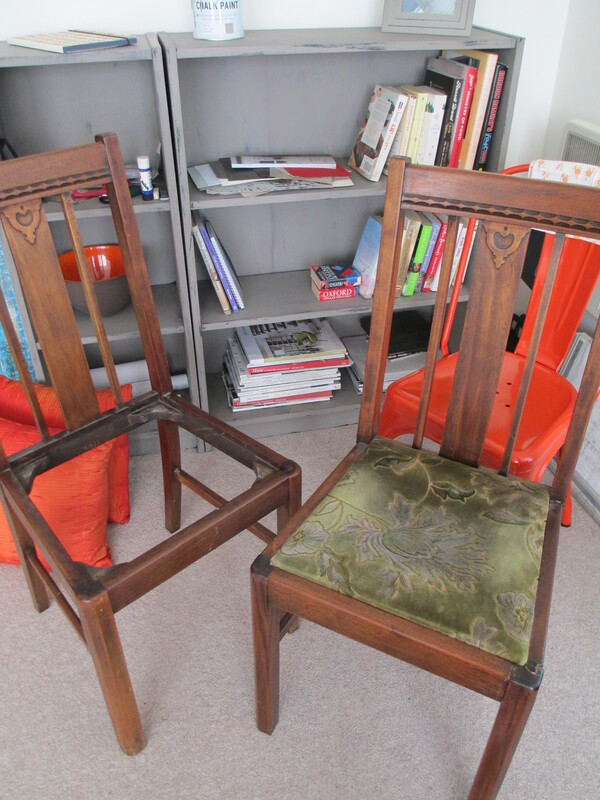 I bought these chairs in a second hand shop. I’ve sought a little advice from a professional interior designer regarding their period and I’ve been told that they are early-mid 20th Century; probably from the Arts and Crafts era. 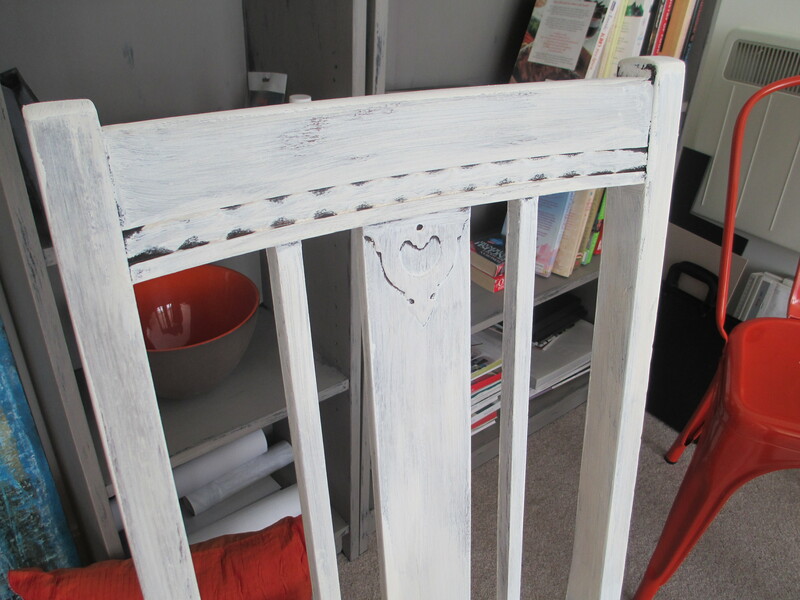 They have very subtle carving detail that should be highlighted beautifully with the distressed chalk paint. Well, that’s the plan. Nice chairs. Not so nice shade of wood or cushion fabric. LOADS of potential. So I rolled up my proverbial sleeves today and got to work on breathing new life into these chairs. I’ve only applied one coat of Pure White so far and already the chair looks amazing. This is an example of ‘upcycling’ at its very best. There’s a lot of satisfaction in taking a few old and unloved pieces of furniture (especially when they have a little bit of historical value) and completely transforming them. I just hope that I’m able to give them a new home. These chairs (either together or individually) would look great anywhere; in a hallway, bathroom, bedroom, living area or kitchen. And even though they are more traditional in style; because I’m applying the paint fairly lightly (to allow the wood underneath to show in places) they have an overall distressed look which will be right at home in a contemporary interior. I might even sand a few areas to further emphasise the distressed look. Seeing is believing: what a difference! 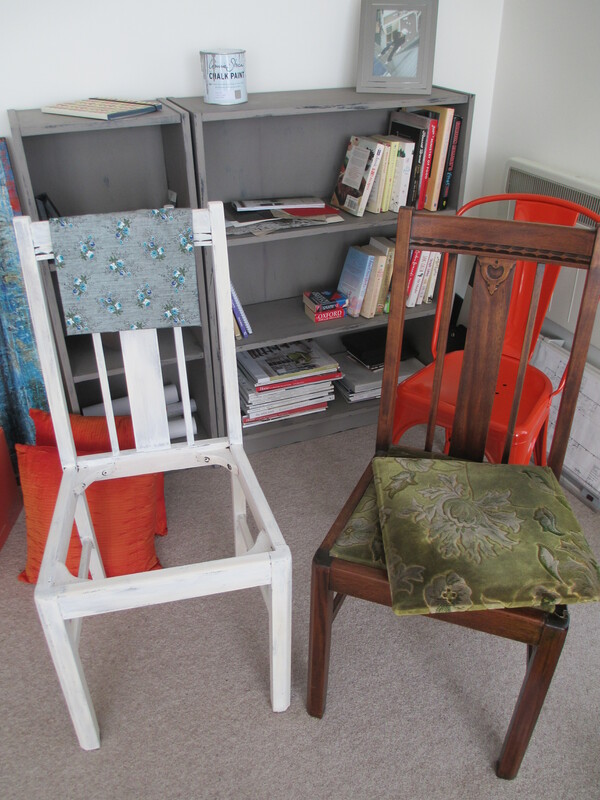 The fabric that has been draped over the ‘Annie Sloan’ chair will be used to reupholster the cushion. It is a vintage 1950s fabric that I recently purchased from Etsy. The grey tones in the background will add an overall modern vibe and the white in the floral pattern will compliment the white colouring of the chair. An excellent choice, if I don’t mind saying so myself! An excellent example of how chalk paint can help to highlight intricate carving but still retains character. LOVE! I’ll be sure to upload photos of the finished pieces!! love your work! I wish I had so much imagination for stuff like that. Never been any good at re/up-cycling (no good for a designer is it? ).